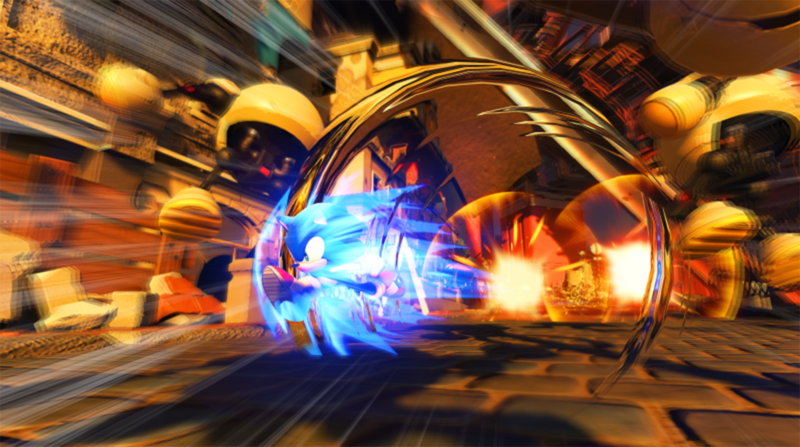 At EGX 2017, I had the opportunity to check out the second Sonic title to be released by Sega this year; Sonic Forces. With Sonic Mania doing pretty well, can this follow suit? So one of the big new additions for this game is the fact that you can create your own character. Unfortunately I couldn't make my own one during the demo and therefore can't comment on how deep the customisation goes, however this is something that the Sonic fan base have apparently been requesting for a long time. This obviously leads me into the first segment I tried which was the tag demo. This allowed me to play as both Sonic and the created character through a level. The whole aspect of teamwork and having each other's back is being pushed a lot here and therefore you can switch between the two at will, each being able to bring their own skills to the table. Sonic hasn't changed much in terms of abilities, so I tended to play around more with what the custom character could do. He has a flame throw to dispose of enemies, along with being able to hook on to obstacles during a level. The big thing here is that there is more than one path to take and while there will always be one that both characters can take, sometimes in order to get to certain parts, you'll need the abilities of the custom character. There is also a tag team mechanic in which you high five each other and blitz through an uncountable number of enemies to reach the end goal or next part of the map. A cool little moment indeed and as long as its not over done, it can be used to highlight some key segments during gameplay. I also got to play through a boss battle as Classic Sonic in Green Hill Zone. This started off the standard way with Eggman going from left to right while swinging around a huge chainsaw. Once this is cleared, he backs up into the Egg Dragoon which you may remember from a previous title in the series. This is where it gets a little trickier as you'll see Eggman try to hit you with debris, gun you down and impale you with spiked drills. Although with most boss battles its a case of finding that one thing to deflect back and in this case, it'll be a specific rock that gets sent along with everything else that's chucked at you. A fun little boss battle and it gives me hope in regards to what will be thrown at you later on in the game. Lastly we got to play through a stage as today's Sonic, as we witness a city under siege by Eggman's Death Egg robots. In the background we have other characters from the series communicating with Sonic about the current situation as they are handling their own situations elsewhere, we even get word that Shadow was somewhere nearby. 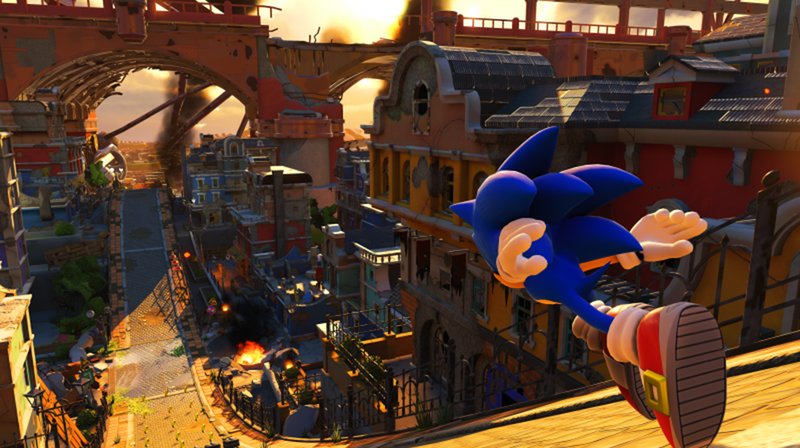 I also feel that they are trying to blend in areas of Sonic's world to make the transitions seem natural. During the run, I could swear I saw Green Hill and its aesthetics in the background, and the deeper you got into the city, the more the city environment took over. If so, that is a really cool way of bringing all these aspects of the Sonic universe together without it looking jarring. It also seems that the power ups that were first introduced in Sonic Colours are back and will aid you in not only getting past enemies, but also reaching areas you couldn't reach normally. Just based on the small time I had with the game, Sonic Forces is shaping up to be another great adventure for the blue blur. Sonic Mania hit us with a huge slap of nostalgia while also reinventing on it. Sonic Forces looks to show us the best bits of its transition to 3D while also trying to reinvent once again. The game is visually beautiful and based on the recent story mode reveal, this is the first time I've seen Eggman so close to actually taking over the world with a much more series tone this time around. Sonic has always been a favourite of mine and with the success of Mania, I hope this release also reaches the same levels if not further.